The way to school and back home is a favourite ride for every child. It is even more fun on a Tata Motors' 'Skool' bus as it is especially suited to meet the safety and comfort needs of youngsters. The 'Skool' Bus from Tata Motors has several features in addition to the Government's safety norms specifications. The emergency door is suitably positioned for optimum convenience of access when necessary. Higher life and better resale value of the bus provides unmatched advantage to the operator. The 'Skool' buses are available in a wide range for your convenience, from 23-seaters to 56-seaters. Both AC and Non-AC vehicles are available in Diesel and CNG options conforming to BS IV norms. 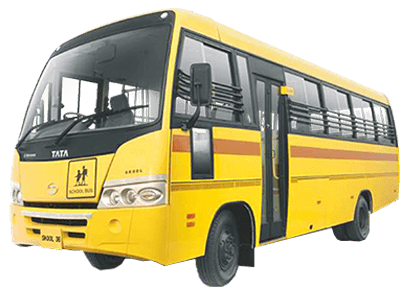 Chassis for school buses are available in both Diesel & CNG options, overall length varying right from 5m to 12m, in BS IV specifications. We understand just how energetic and active a group of school children may be. That is precisely why the school buses have been incorporated with numerous essential features that ensure a completely secure journey.